This week the founders of Instagram, Kevin Systrom and Mikey Krieger, are leaving the company. Instagram is only about 8 years old and has continued to grow since it’s acquisition by Facebook in 2012. I was an early user of Instagram and from the start was really into the idea of Instagram meetups. One of the first meetups I helped organize was in South Park on January 20th, 2011, where we got a surprise visit from Kevin, Mikey, Josh Riedel, and Shayne Sweeney. Instagram had a surprisingly big impact on my life. After organizing a ton of #Instawalks, I developed a reputation as an early evangelist and pioneer of the mobile photography movement. I eventually left my job as a game designer at Tribal Games and started working for Postagram as a community manager. I got write ups in Wired and The New York Times and was a regularly appearing guest on several Revision 3 shows. So big shout out to Mikey and Kevin. Instagram had a huge impact on my life and many others, I’m sure. Can’t wait to see what you make next. Instagram still doesn’t allow you to upload photos via your web browser, but they have recently enabled users who don’t have the Instagram to upload via the mobile web. So here’s how you can upload to instagram via the web using Google Chrome or Safari by spoofing a mobile web browser. If you are are using Google Chrome, you’ll need to use an extension like User Agent Switcher (aka “UA Spoofer”) to spoof a mobile device. Once this extension is installed, click the UA Switcher icon to a mobile device setting (like iPhone 6). Then the upload button will appear as a camera icon on the bottom of your screen. Click it to upload your photos from your laptop. The Device Emulator is built in to Safari. To get to it, simply go to the Safari menu bar Develop > User Agent > Safari iOS 7 – iPhone. And that’s how to upload photos to instagram from web without using the mobile app. Have you tried the technique out yet? Let me know how it works for you. 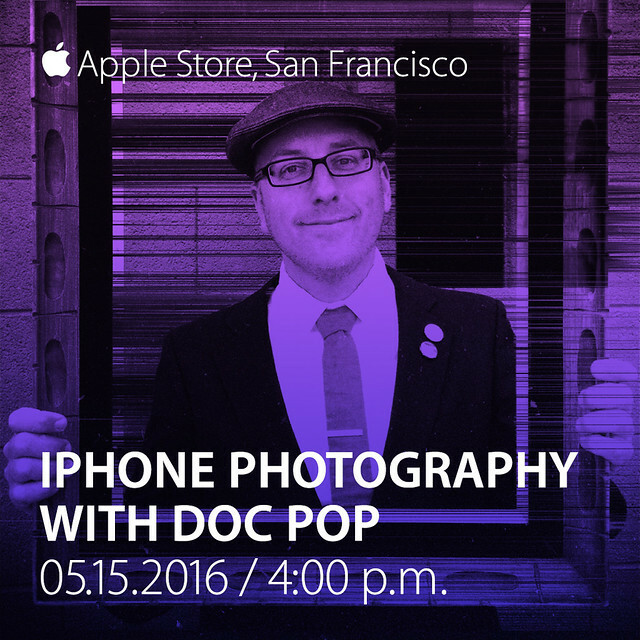 I had a great time hanging out at the downtown Apple Store in San Francisco today, talking about experimental iPhone photography and apps. Thanks to everyone who came out. It’s kind of cool to think my weird little talk might be the last presentation they ever have in that store (the new shop is opening real soon). Seene’s effect is best viewed through their app, which uses the accelerometer to adjust your perspective, but if you want to get creative, you can create really unique glitch art with your Seene. Here’s my tutorial for creating “Deep Glitch” photos with Seene and Glitch Wizard.